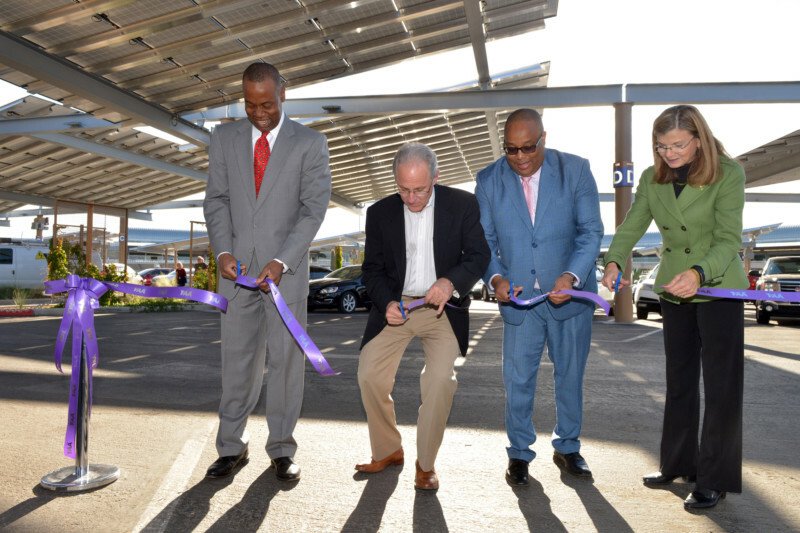 The Tucson Airport Authority (TAA) celebrated the completion of the Tucson International Airport (TUS) Solar Project on December 6 with a ribbon cutting ceremony. The $14.3 million project is expected to generate an additional 411,800 kilowatt hours (kWh) monthly at a savings of $35,000 per month at TUS. The energy generated powers up to half of the electricity in the terminal and concourses. Beyond the environmental impacts, the solar canopies covering the Hourly and Daily lots, directly adjacent to the terminal, the solar canopies provide customers much wanted shaded parking to nearly all of the spaces available. At the ribbon cutting dedication, TAA welcomed Mayor Jonathan Rothschild, FAA Regional Manager Mark McClardy, TAA Chairman Tony Finley and TAA President and CEO Bonnie Allin spoke to a crowd of guests that included the local businesses involved in the project. Each speaker validated the importance of the finished project and what it means for Tucson. The project was split into two phases, and started in 2013. Phase I included the installation of 51 solar panels while Phase II installed 78 solar arrays. Both phases brought the overall environmental and savings impact to a reduction of 25,000 gallons of gas per month and 245 tons of carbon dioxide (CO2) per month. The project was funded by grants from the Federal Aviation Administration (FAA) and Arizona Department of Transportation (ADOT) with a matching contribution by TAA. The FAA funded 91.06% of the project. The design engineering team includes Monrad Engineering, Inc., electrical design; DOWL HKM, civil engineering, Herzog Associates, architectural; Schneider Structural Engineers, structural engineering; Wheat Design Group, landscape architect; and Sturgeon Electric, general contractor.